Hello! This year I told myself that I was going to try to broaden my crafting horizons. Try out for a new design team. Or two. 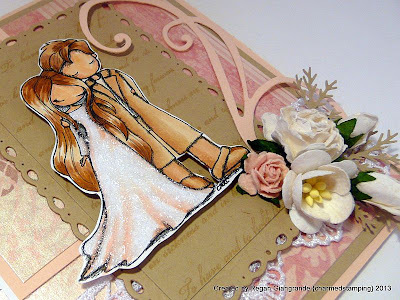 See what the big wide paper crafting world had to offer. Even if I didn't make the team.. I happened to see that Tiddly Inks is currently hosting a design team call. (Click HERE for details.) And after about a week of talking myself into it (I made the mistake of checking out the insanely talented competition first!) I decided to create something and throw my hat in the ring. I chose to work with You and Me. It's such a sweet and romantic image! Perfect for the wedding card I needed to make. I colored the couple with Copics and added liberal amounts of Frosted Lace Stickles to her dress. My layout is based on the July sketch from Crafting Life's Pieces (CLP-60). 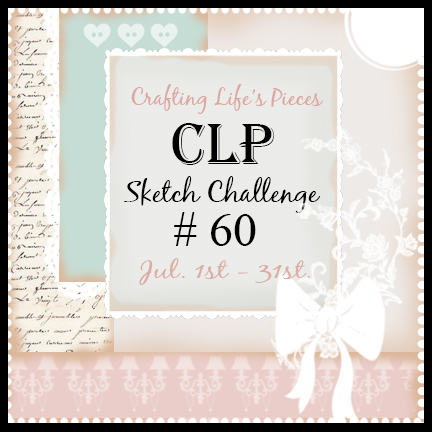 I really am all about the embellishments and I love CLP's sketches because they are always dripping with gorgeous layers and details! My papers are from DCWV (The Luxury Stack). 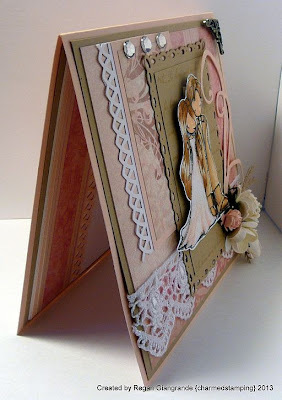 I have used a couple of dies - Romantic Rectangles from Spellbinders and a Magnolia flourish. 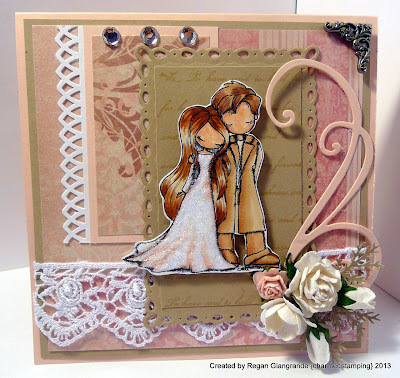 The words behind the blissful couple is a Wedding Word Print stamp from Hero Arts. I used Tim Holtz Distress Ink in Vintage Photo for this. There's also some bling, lace, flowers, a metal filigree corner and a couple of Martha Stewart punches thrown in for good measure! And there you have it! Wish me luck! Markers used: Copics (E000, E00, E11, E21, E23, E25, E31, E33, E34, E37, R00, R02, R20). It is a beautiful card and the images are darling. Your coloring is always beautiful. You should be a snap to get in. I am happy with 2 DT's but admire you gals that have lots. I'm just to lazy to want to be that busy. All the best for the DT call - their images are so beautiful. Love the shimmer on the dress and your card is super. 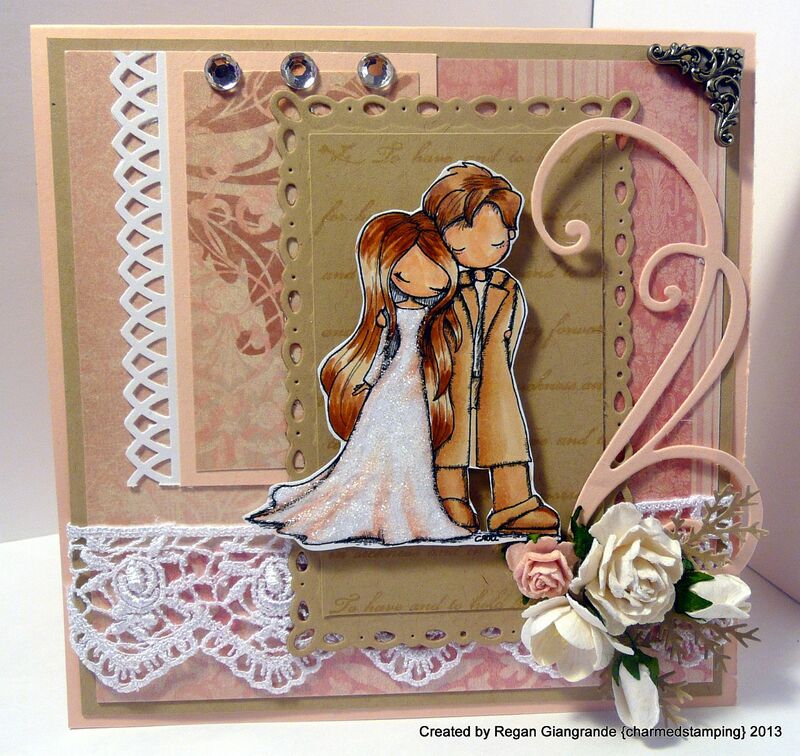 Thanks for sharing this with us at Crafting with Dragonflies for our bloghop and challenge on weddings! Beautiful !! Love the lace and flourish!! Good luck with the dt call! I've been a terrible friend not commenting on your posts lately! Life has been crazy & I haven't commented on anything other than DT obligations. Such a wonderful card! The image is beautiful, and her dress look just amazing! Love the lace. Thanks for joining us at CLP. just beautiful, lovely details too.Goodluck at Sarah Hurley Challenges. What a lovely card. I love this image & her dress is just beautiful. Such a gorgeous card design. Thanks for joining us at Divas By Design this week.